The Shadow is an independent agent. The history of The Shadow character is a long and old one and really demonstrates the beauty, financially, of good cross marketing. In 1930, the publishing house of Street and Smith had a detective magazine cleverly titled Street and Smith's Detective Story. As the sales for it were starting to slip, the company knew it had to come up with a way to rebuild interest and it found that way on the radio. The new program, first aired on CBS in July of that year, accomplished two things when it gave listeners enjoyable suspense stories while constantly reminding the audience that these stories came out of the pages of the Detective Story magazine. To really give the broadcasts an added dimension for people to remember it by, they created the mysterious narrator they called The Shadow. Though not an actual participant in the tales themselves, the Shadow had such a malevolent and eerie persona to him that the scheme nearly backfired. The viewers did rush to the newsstands to get their hands on the magazine but they were expecting the Shadow! With considerable consternation, the publishers realized that there were two problems. First, the potential customers were walking away empty-handed. Second, and worse, the creators did not have any form of copyright existing to protect their own creation. They didn't have much time to solve both dilemmas. The salvation came in the form of a writer named Walter Gibson, who was is in New York trying to work up interest in a sequel to a history of Houdini he had done. This sometime journalist and sometime assistant to Houdini and other magicians was told about the new series and grew intrigued enough to head home and very quickly put together the first in the Shadow series. Though it was altered somewhat in the editing stage, it went out largely as Gibson had drafted it. At last the Shadow Magazine was born. The publishers had a legal hold on the name and concept and the readers had a magazine to go along with the increasingly popular radio program. One huge difference, however, was that the Shadow in the magazine was an integral part of each adventure while the radio programs had the Shadow as just the narrator. Apparently this would not be too much of a problem as it stayed that way for several years. It wasn't until 1937 when the program, which had switched to NBC in its second full year, now moved to the Mutual broadcasting network. With the move came the change of putting the Shadow into the storylines as he had already been in the magazine for six years. And so the series would last for another full decade. Every week the Shadow would fight evil and injustice over the airways and every two weeks he would do so in the pages of the magazine. Of course, on occasion he would show up on the big screen in a movie or a serial. And, in 1940, he became popular in newspapers as a syndicated comic strip. 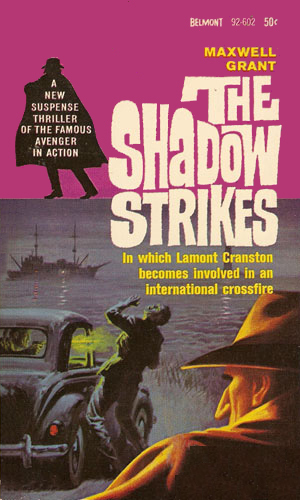 Elliott's emphasis for the Shadow was on murder mysteries and not crime fighting and he made less and less use of the mysterious figure of the Shadow and more of its alter-egos (he had several identities to choose from), most notably Lamont Cranston. Moreover, the character didn't hunt down and blast the perpetrator away - he worked closely with the Police Commissioner to lawfully apprehend the miscreant for trial. 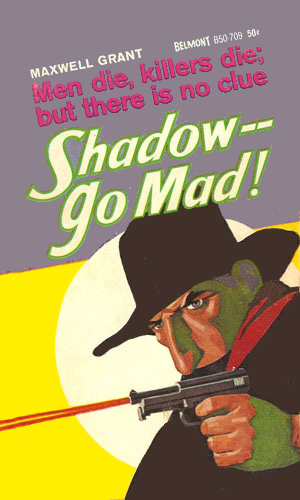 Whether a product of age or of the change, the popularity of the Shadow magazine quickly waned and it moved from a monthly publication to a quarterly. Finally, in 1949, the last issue was released and the Shadow disappeared from the printed page. The radio program would continue on until the end of 1954. In the early 60's, Belmont Towers decided it would resurrect the series with a 'Return of' novel followed by reprints of the original stories. 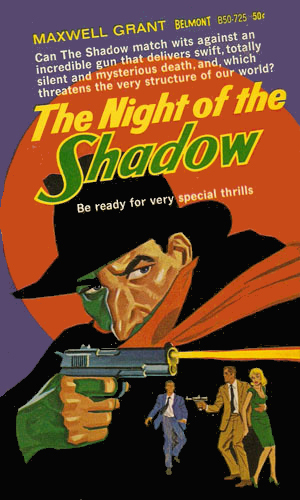 Gibson was brought in to pen the story which he gladly did and the Return Of The Shadow was released in paperback in 1963. Then, however, things changed dramatically. Whether it was a change of heart or, as I personally feel it to be, a bowing to financial pressure, BT decided the reprints would be out and new, original stories would be done instead. However, rather than keep the character had he had so popularly been for over 300 adventures, drastic changes would be made. The first changes were mainly to do with the powers of the character. Where the original character had, especially on the radio, the ability to 'cloud men's minds', the revamped Shadow had mental powers far beyond normal humans. Remember that this was golden age of comics and the prowess was a result of training from an Oriental mentalist, usable only when combined with the special cloak, slouch hat, and girasol ring that the Master passed on to the Shadow (where would an Oriental master get a slouch hat?). Later, even greater changes would occur as the type of enemy was altered. It is important to remember that James Bond was just hitting it really big and the Man From U.N.C.L.E. was hitting the airways. Spies were in! Moreover, as Bond had SPECTRE and Solo had THRUSH, It apparently seemed a natural to BT to make the resurgent Shadow an agent fighting an evil organization. Thus was C.I.P.H.E.R. born and Lamont Cranston was there to challenge it. Die-hard fans of the old Shadow grimaced deeply. Walter Gibson flat out refused to go along with the changes, leaving the writing to a far younger Dennis Lynds. And it didn't last very long, going only 8 adventures when the original went over 300. That is the downside of the series. The upside is that it piqued the interest of a good friend of mine, .John, who then passed that interest on to me. This made me a big fan of the Shadow in specific and spy adventures in general. 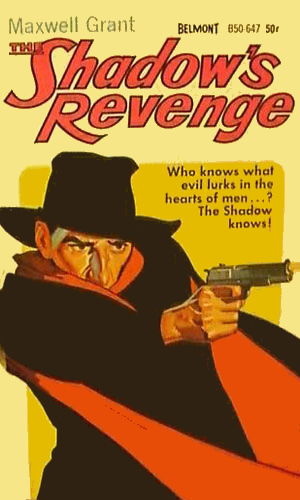 If you are expecting the Shadow from the pulp novels, you'll be confused and certainly disappointed. If you are expecting the Shadow from the hundreds of 30 and 60 minute radio broadcasts, you'll be even more confused and disappointed. If you are looking for a cross between a spy and a superhero, with a really cool slouch hat thrown in, who knows? [Sorry, I've got to do it!] The Shadow knows! Both the Shadow and the FBI are extremely interested in a group calling itself the Liberation Front and supposedly handling the escape from behind the Iron Curtain of hundreds of freedom-seeking people. Something is definitely wrong with the Front, however, as the bodies start to pile up. When a man working for the Peace Corps shows up in London dead, that organization fears nefarious forces are at work and asks for the help of Commissioner Weston and his friend, Lamont Cranston. 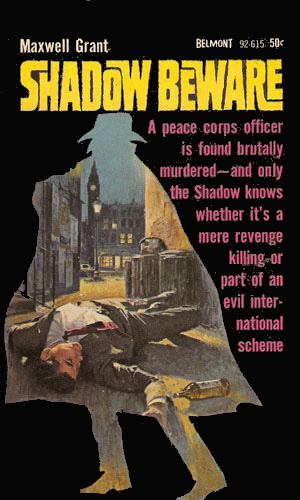 This takes the Shadow to England in search of a killer and a mad scheme involving international relations. 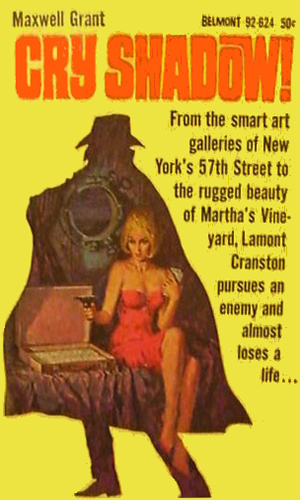 Someone is stealing artwork from various galleries around New York, prompting Lamont Cranston and Margo Lane to investigate. All evidence points to a Columbian smuggling ring that even the Shadow will have trouble breaking. A demon out of the darkness of the jungles of Africa has arisen to kill, destroy, and totally dominate the west African area of the Congo. 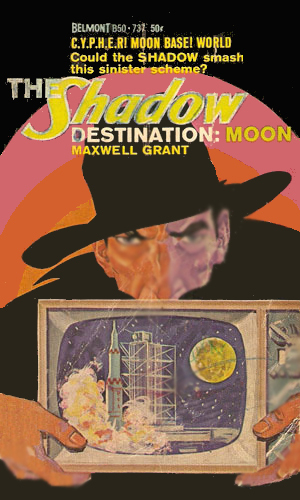 When the head of a relief mission, a friend Cranston and Weston, disappears while investigating the fantastic stories, the Shadow decides a visit to that region is in order. The first introduction of CYPHER, this adventure deals with one man's desire to control an entire state. To accomplish this, he needs to remove several powerful men and for that he needs the help of C.Y.P.H.E.R., an organization willing to provide any illegal service to anyone with enough money. 6 Shadow - Go Mad! 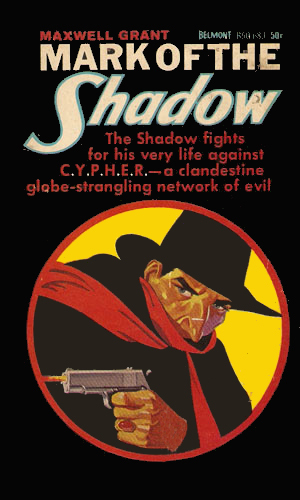 Now that CYPHER knows that the Shadow is after them, they lay a terrific trap by unleashing a series of bizarre murders around the world, killings that have no apparent motive except to lead first Margo Lane and then Lamont Cranston into a deadly trap. The Red Chinese, seeking to extend their influence into Latin America, is backing a secret plan to overthrow one of the nations there. Also on hand to stop the downfall of one of the few democracies in the region is the Shadow, along with his team of highly trained agents. I don't for a moment claim that the eight adventures of the revamped Shadow are as good as the previous 300+ ones. I don't happen to think that at all. The changes move the character from the mysterious to the superhero and loses too much along the way. So if you followed the storyline from the 1931 character up through the 40's and then met the new one, you wouldn't like him at all. But if, like me, you started with them as a teenager and then branched out both into fuller spy fiction as well as the original stories, they will always hold a very special place in my memory. As I reread them for this compendium, I lose 35+ years, at least for a short time. And that is not a bad thing at all. I only read "Cry Shadow" and it was dull and mundane! If the rest of the series is this bad, you might want to skip it! !